Delegate: Mr. Tim Ramsey , US Department of Energy. The National Science and Technology Policy, Organization, and Priorities Act of 1976 established the Office of Science and Technology Policy (OSTP) to provide the President and others within the Executive Office of the President with advice on the scientific, engineering, and technological aspects of the economy, national security, homeland security, health, foreign relations, the environment, and the technological recovery and use of resources, among other topics. OSTP leads interagency science and technology policy coordination efforts, assists the Office of Management and Budget with an annual review and analysis of Federal research and development in budgets, and serves as a source of scientific and technological analysis and judgment for the President with respect to major policies, plans, and programs of the Federal Government. Within the OSTP exists the Subcommittee on Ocean Science and Technology (SOST), whose purpose is to advise and assist on national issues of ocean science and technology. In November 2018, the SOST released the second iteration of a decadal report titled Science and Technology for America’s Oceans: A Decadal Vision. The SOST advises and assists on national issues of ocean science and technology, and the report identifies five goals to advance U.S. interests in the coming decade, including promoting new energy sources and developing resilient coastal communities. This document provides guidance to many agencies working on ocean science and technology, including ocean energy, and helps them coordinate efforts. The U.S. Department of Energy's (DOE’s) Water Power Technologies Office (WPTO) aligns itself with the goals outlined in the SOST Decadal Vision, but more generally serves to advance cutting-edge technology to modernize the U.S. hydropower fleet and drive leadership in new ocean and river energy, with the goal of delivering low-cost power and resiliency to the nation’s power grids. WPTO and a handful of other agencies, including the National Science Foundation and the U.S. Navy’s Office of Naval Research, are the primary groups assisting with funding for research of ocean energy technologies. Because marine renewable energy is an early stage market with limited incentives for investment, WPTO has a clear role in expediting the development of innovative marine renewable energy technologies. WPTO makes investments that support key technology innovations, mitigate risks, and assist the private sector in creating a robust U.S. marine renewable industry by providing funding and technical assistance. The Office has been working to solicit comments and refine a publicly available long-term strategy for its research and development (R&D) priorities (https://www.energy.gov/eere/water/articles/wpto-releases-updated-draft-mhk-strategy). WPTO funds research in four main topic areas: (1) foundational and crosscutting R&D, (2) technology-specific system design and validation, (3) reducing barriers to testing, and (4) data sharing and analysis. Work in each topic area provides the industry with fundamental tools, research, and innovations that tackle specific challenges hindering development. The Naval Facilities Engineering and Expeditionary Warfare Center (NAVFAC EXWC) continues to actively support R&D of various renewable energy conversion technologies. NAVFAC EXWC's funding efforts focus on advancing technology development to harness marine energy resources to ensure energy security and for powering U.S. Navy and Marine Corps assets both on- and off-shore. NAVFAC is funding and actively managing the Navy's Wave Energy Test Site (WETS) in Hawaii, including the University of Hawaii's Hawaii Natural Energy Institute's on-site monitoring and support of the test site, and marine renewable energy development efforts at the University of Washington, Applied Physics Laboratory. In FY 2018, the Defense appropriations bill passed by Congress provided $35 million for the U.S. Navy to support Alternative and Renewable Energy research and development. The FY 2019 Defense Appropriations bill saw a $7 million increase specifically for marine and hydrokinetic (MHK) energy research. Separately, the FY 2019 National Defense Authorization Act included $20 million for the Navy to conduct research on maritime robotics technology, which could also support marine energy. In October 2018, the Water Resources Development Act of 2018, included as title I of the America’s Water Infrastructure Act of 2018 (S. 3021), was signed into law. The new law provides investment in ports, channels, locks, dams, and other infrastructure that supports the maritime and waterways transportation system and provides flood protection for homes and businesses. This represents Congress’ continued interest in locally driven, but nationally important, federal investments in water resources infrastructure. In June 2018, President Trump signed Executive Order 13840 Regarding the Ocean Policy to Advance the Economic, Security, and Environmental Interests of the United States. This Executive Order replaces the previous one from 2010 and places an emphasis on economic growth and national security, as well as establishing a new federal interagency Ocean Policy Committee. Also available as a market incentive for marine renewable energy developers are Clean Renewable Energy Bonds (CREBs). CREBs are tax credit bonds, the proceeds of which are used for capital expenditures incurred by governmental bodies (including states and municipalities), public power providers, or cooperative electric companies for a qualified renewable energy facility, marine renewables included. The bondholder receives federal tax credits in lieu of a portion of the traditional bond interest, resulting in a lower effective interest rate for the borrower. The issuer remains responsible for repaying the principal on the bond. At the state level, Qualified Energy Conservation Bonds (QECBs) are another incentive program that may be used by state, local, and tribal governments to finance certain types of energy projects. QECBs are similar to CREBS, but are not subject to a U.S. Department of Treasury application and approval process. With QECBs, the borrower who issues the bond pays back only the principal of the bond, and the bondholder receives federal tax credits in lieu of the traditional bond interest. The tax credit may be taken quarterly to offset the tax liability of the bondholder. Marine renewable energy technologies are an eligible energy resource under numerous states’ Renewable Portfolio Standards (RPS) and voluntary renewable energy goals. This market-based mechanism requires utilities to source a percentage of their electricity from renewable resources. As of this writing, 29 states have RPS in place and 8 states have voluntary renewable energy goals or targets. Many states also have Public Benefit Funds (PBF), which are a state-level market support mechanism designed to provide continued support for renewable energy resources, energy efficiency initiatives, and low-income energy programs. The incentives for each PBF vary by state. MHK technologies can also benefit from funding opportunities through non-profits and public-private partnerships, such as the Oregon Wave Energy Trust. Since 2008, WPTO funding has been split roughly equally among private companies, universities, and the national labs. The bulk of WPTO funding to-date for marine renewable energy has been allocated toward wave energy research, followed by cross-cutting R&D that supports multiple resource types, and then current technologies (see charts). Developers can seek DOE WPTO funding through several different competitive funding mechanisms. Funding Opportunity Announcements (FOAs) are competitive grants for industry, academia, or national laboratories to form partnerships in conducting research and testing. Some FOAs are available to international applicants. Small Business Vouchers (SBV) provide clean energy small businesses access to the state-of-the-art facilities and experts at participating DOE national laboratories (see Research & Development Section). Small Business Innovation Research (SBIR) and Small Business Technology Transfer (STTR) programs are methods through which federal agencies with large R&D budgets set aside a fraction of their funding for competitions among small businesses to pursue early stage research. Small businesses that win awards in these programs keep the rights to any technology developed and are encouraged to commercialize the technology. Lastly, DOE’s Technology Commercialization Fund (TCF) leverages R&D funding in the applied energy programs, paired with private partners, to mature promising energy technologies with high impact potential. Pacific Marine Energy Center (PMEC): Formerly known as the Northwest National Marine Energy Center, PMEC is a partnership between three universities in the Pacific Northwest: University of Washington, Oregon State University, and the University of Alaska Fairbanks. The organization coordinates access to marine energy test facilities across the region and works with stakeholders to address key challenges slowing the adoption of marine energy. Hawaii National Marine Renewable Energy Center (HINMREC): HINMREC is operated by the Hawaii Natural Energy Institute at the University of Hawaii: Manoa. Its primary objective is to facilitate the development and implementation of commercial wave energy systems. 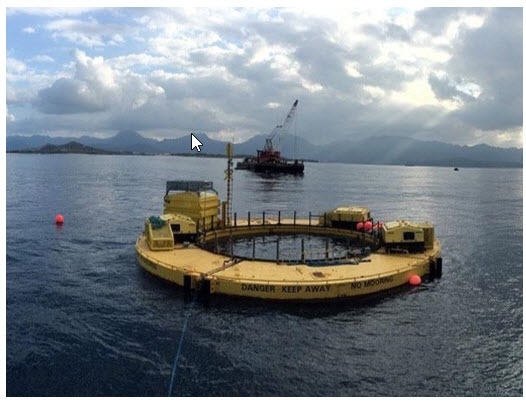 HINMREC helps with the management of two test sites in Hawaii, WETS and the OTEC Test Site (see Open Sea Test Sites section). Southeast National Marine Renewable Energy Center (SNMREC): SNMREC is operated by the Florida Atlantic University. Although SNMREC has research interests in all marine renewables, it places an emphasis on those resources available to the South Eastern United States: ocean currents and offshore thermal energy conversion. Sandia National Laboratories (SNL): SNL conducts research on advanced controls, simulation of marine renewable energy environmental impacts, advanced materials for coatings and construction, testing and simulation of technologies, and resource characterization. National Renewable Energy Laboratory (NREL): NREL's water power program conducts research on energy markets, grid integration, resource characterization and mapping, design and simulation, technology evaluation and validation, as well as performing full-scale validation tests on systems and components. Pacific Northwest National Laboratory (PNNL): PNNL conducts research on environmental impacts, resource characterization and modeling, advanced materials and manufacturing, monitoring techniques and data gathering, and education outreach. PNNL is also responsible for implementing Annex IV under OES on behalf of WPTO. Oak Ridge National Laboratory (ORNL): ORNL conducts research on environmental impacts of instream technology, advanced materials for coatings and construction, design for manufacturing, and assessment of stream resources. In June 2018, WPTO announced six awardees selected to receive a total of $6.7 million in federal funding. The Igiugig Village Council (IVC) in Alaska, in partnership with the Ocean Renewable Power Company, was selected to receive $2.3 million to further design, construct, and test the RivGen cross-flow river current turbine system. Awardees for the other five projects to receive funding include: Resolute Marine Energy, Oscilla Power, Inc., Enorasy, and the University of Alaska - Fairbanks. During 2018, Ocean Power Technologies brought to market a new suite of products—including a subsea battery energy storage system and a hybrid model of their wave energy converter (WEC), the PowerBuoy. 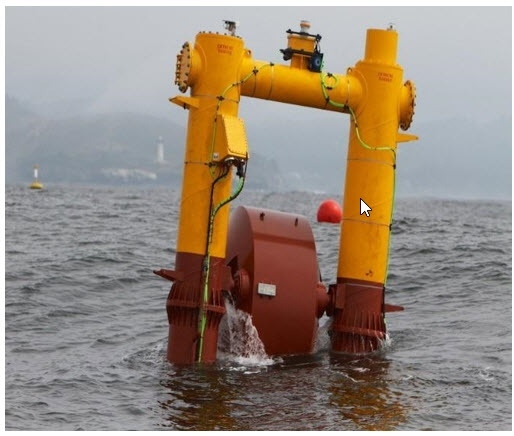 Also in 2018, Ocean Power Technologies signed an agreement with Enel Green Power to evaluate deploying a PowerBuoy system along the coast of Chile. 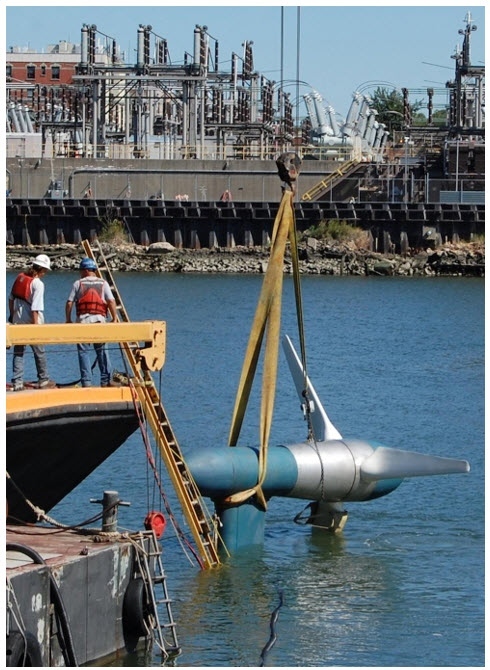 In January 2018, Ocean Energy USA (OE) announced that it will construct its 1 MW oscillating water column device at Vigor Shipyard in Oregon. This project is jointly funded by WPTO and the Sustainable Energy Authority of Ireland (SEAI) and demonstrates the value of international collaboration. The OE Buoy is currently under construction at the shipyard and once complete will be towed to the U.S. Navy’s WETS in Hawaii for testing. 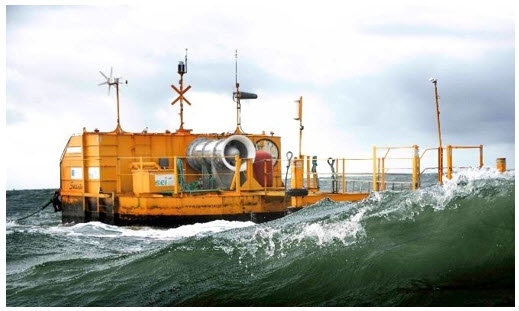 The ocean energy research team at NREL applied their broad expertise in ocean engineering, structural dynamics, fluid mechanics, and control systems to conceive an innovative wave converter concept that could control loads in highly energetic seas while maintaining power production. This new variable geometry wave converter concept was recently awarded a patent by the U.S. Patent Office, No. 10066595 B2. The concept is illustrated in the figure below. Soon, the NREL team will be working with WEC developers in the United States to explore approaches for applying variable geometry concepts to industry designs to improve performance and lower the cost of energy. In May 2018, SNL completed wave tank testing at the Navy’s Maneuvering and Sea Keeping (MASK) basin to investigate the implementation and performance of a series of closed-loop WEC power take-off (PTO) controllers. The latest project results were presented in July 2018 at the Advanced Research Projects Agency - Energy (ARPA-E)-hosted workshop, “Control Co-Design for Wind and Marine Hydro-Kinetic Energy Systems.” SNL’s work in advanced WEC dynamics and controls demonstrates the opportunity for substantial reductions in the levelized cost of energy helping to increase competitiveness of these devices. From April through July of 2018, WPTO collected public comments on its draft report, Potential Maritime Markets for Marine and Hydrokinetic Technologies. The report details the economic and technical landscapes of 14 different non-grid markets for marine energy technologies. These markets include applications such as ocean observation, unmanned underwater vehicles recharging, offshore aquaculture, seawater desalination, or coastal disaster relief. The draft report received over 400 unique comments, and a final report that includes this feedback will be released in 2019. A research group from Integral Consulting, Inc. working in coordination with PNNL, performed a sequence of tests using a new sensor package, NoiseSpotter, which is designed to record sound generated by marine renewable energy devices. This will provide important information related to the potential environmental effects on marine animals of sound generation from these devices. This work is part of the Triton Initiative, which supports the development of advanced and cost-effective environmental monitoring technologies for marine renewable energy applications. Fred Olsen: The BOLT Lifesaver, a point-absorber device, was redeployed in October 2018. 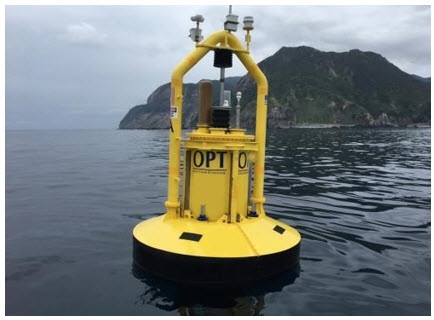 For this deployment the BOLT Lifesaver underwent modifications to host an oceanographic sensor package (Adaptable Monitoring Package), developed by the Pacific Marine Renewable Energy Center, to demonstrate the WEC’s ability to directly power external systems. The BOLT Lifesaver has multiple PTO units, each rated for a capacity of 10 kW. As of this writing, the device has been operational for 96 days and generated over 6,800 kWh. The Living Bridge Project is an interdisciplinary smart infrastructure research project led by the University of New Hampshire. The project has converted the Memorial Bridge into a demonstration "smart bridge" by equipping it with structural health monitoring and environmental sensors on its structural elements and in the tidal Piscataqua River. 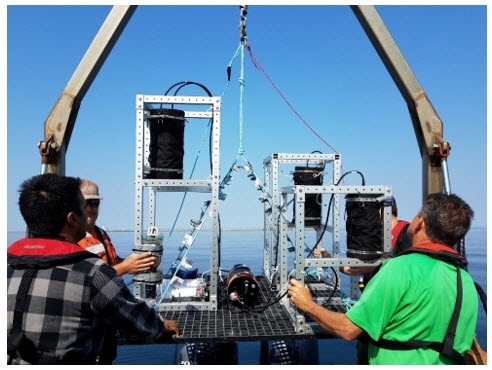 To power these sensors and offset energy usage on the bridge, a 25 kW cross-flow vertical axis tidal turbine has been installed beneath the bridge on a turbine deployment platform designed and built by the University of New Hampshire Center for Ocean Renewable Energy. The cross-flow turbine was supplied by New Energy Corporation of Calgary, Alberta and has been in operation since June 2018; it will remain deployed for one year under this project. Ocean Energy USA (OE): A 1-megawatt OE Buoy, an oscillating water column design, is currently under construction at Vigor Shipyard in Oregon and is slated for testing in 2019 at WETS. The deployment will last approximately one year and will provide useful performance data for model validations, reliability performance, and opportunities for cost reductions. Columbia Power Technologies (C·Power): C·Power has completed physical testing of its novel, direct-drive PTO at NREL. The PTO, which includes a 6.5 m diameter, 4 mm airgap, permanent-magnet 500 kW generator, is being updated in preparation for use in their grid-connected, open-water demonstration project at WETS, starting in the later-half of 2019. This one year deployment will provide valuable reliability data, as well as indicate opportunities for design improvements and optimization. C·Power will begin fabrication of their StingRAY H2 WEC device for WETS in early 2019. 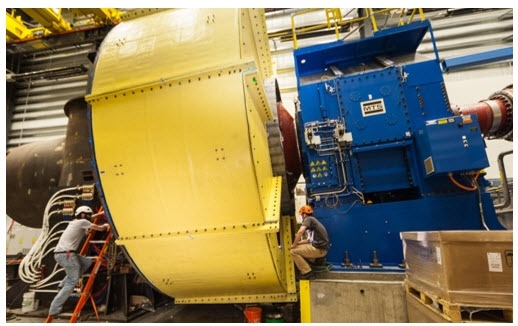 C·Power has also commenced physical testing at NREL of mixed-material (composite and metal) hull components for its structural optimization project and initiated an advanced controls project with SNL; both projects will be completed in 2019. Northwest Energy Innovations (NWEI): NWEI’s Azura™ is a multimode, point absorber WEC that extracts power from both the heave and surge motions of waves to maximize energy capture. NWEI previously tested their technology in Oregon in 2012, and a half-scale device was tested with 98% availability for 19 months beginning in June 2015 at the 30-m berth at WETS. NWEI redeployed their full-scale system at WETS this past February 2018 and is shooting to deploy again in 2020 or 2021. Verdant Power: Verdant’s Fifth Generation Kinetic Hydropower System (Gen5 KHPS) is an axial flow current-capturing turbine system. Verdant and its partners are working on the design of a TriFrame that optimizes turbine spacing and structural requirements to allow for cost-effective installation, operation, maintenance, and retrieval. Verdant plans to test this new system along with their Gen5 KHPS at their pilot project site in the East River near New York City. This project will advance understanding of optimal turbine spacing and best practices for installation, maintenance, and retrieval of underwater turbines. Following the successful demonstration of the TriFrame system in 2020, Verdant is considering converting the Roosevelt Island Tidal Energy project to a fully functioning world-class test and demonstration facility for distributed generation, energy storage, and electric vehicle charging stations, while executing its global commercial launch. 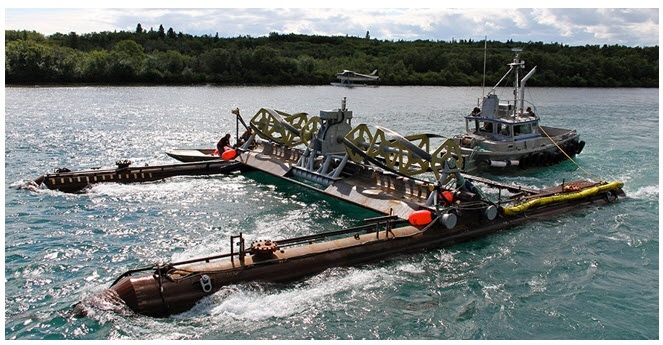 Ocean Renewable Power Company: Igiugig Village of Alaska is partnering with Ocean Renewable Power Company (ORPC) to develop the RivGen Power System, a submerged cross-flow river current turbine system. In 2014, WPTO funded a successful demonstration of ORPC’s RivGen turbine and has decided to provide additional support to deploy and operate a next-generation RivGen Power System in 2019. The project will serve as an example to remote locations on how they can reduce energy costs and offset diesel generation using marine energy. Ocean Power Technologies (OPT) has a contract to supply Oil & Gas company, Premier Oil, with one of its PowerBuoy systems for the deployment in an oil and gas field in the Central North Sea. The PowerBuoy will serve as an intelligent platform to provide communications and remote monitoring services at the site in support of Oil & Gas operations. OPT is targeting a deployment date in the summer of 2019. Oscilla Power: Oscilla Power is developing a point absorber with a heave plate type WEC called the Triton WEC. The company has done extensive testing at scale and recently concluded WPTO-funded testing on survivability design methodologies. The company is aiming to test their system in the second half of 2019 at WETS in Hawaii. Both AquaHarmonics and CalWave, first and second-place winners of the 2016 Wave Energy Prize respectively, have been advancing their designs. Both companies are aiming to deploy scaled-systems at WETS in the coming years. In June 2018, the United States was selected as the host country for the 2020 International Conference on Ocean Energy. The event will be held in Washington, D.C. This is the first time the event has been held in the United States and will serve as an excellent opportunity to bring in international knowledge and expertise to advance marine energy both domestically and abroad. DOE will share U.S. expertise in marine energy technologies research, development, and testing at the event. At the national level, there is no existing marine spatial planning policy for ocean energy. On June 19th, 2018, the President signed Executive Order 13840 entitled “Ocean Policy to Advance the Economic, Security, and Environmental Interests of the United States”. The new EO revokes Executive Order 13547 (Stewardship of the Ocean, Our Coasts, and the Great Lakes) of 2010 and in its place, emphasizes a new ocean policy and accompanying processes to advance the economy, national security, and environmental interests of the U.S. The new ocean policy does not explicitly mention Marine Spatial Planning (MSP) or prioritize its inclusion for Federal engagement with ocean matters. State and Regional Ocean Partnerships will engage in MSP and issue marine spatial plans as decided by the individual states or through other regional mechanisms such as regional ocean partnerships. Previously, the Final Recommendations of the Interagency Ocean Policy Task Force, Executive Order 13457, and the Nation Ocean Policy Implementation Plan (Appendix Milestones) established and supported MSP at a regional level. The United States and its territories were divided into nine Regional Planning Bodies (RPBs). As of 2018, some RPBS have formed and are at various stages of the marine planning process (e.g. the Mid-Atlantic RPB and the Northeast). The new executive order calls for the establishment of an Ocean Policy Committee (OPC) to replace the previous structure of the RPBs and the National Ocean Council (NOC). However, the new OPC has a similar mandate to the prior NOC and specific to Marine Spatial Planning the new EO encourages the OPC to work with stakeholders, including regional ocean partnerships, to assist when matters that may require interagency or intergovernmental solutions arise. Several states in the United State have developed and implemented their own marine plans. Some existing plans were initiated before the release of the National Ocean Policy, and in 2018 Washington State adopted a Marine Spatial Plan for their Pacific Coast; other states are considering similar actions. Pre-selected areas for ocean energy development have not been defined on a national level, though State Task Forces led by the Department of Interior and the Bureau of Ocean Energy Management (BOEM) have identified and set aside initial areas for the development of offshore wind. A number of states have also identified selected areas for ocean energy development (e.g. Rhode Island, Massachusetts and Oregon). Areas identified through spatial planning and pre-selected processes have typically involved collaborative processes including multiple stakeholder groups. Multiple other federal and state agencies are consulted during the permitting process to ensure that projects comply with a number of federal and state environmental protection statutes. These agencies include but are not limited to: the National Oceanic and Atmospheric Administration (specifically the National Marine Fisheries Service within NOAA), the U.S. Fish and Wildlife Service, the Environmental Protection Agency and the National Parks Service. Scenario 5 – Any project on the OCS, competitive lease process – 6-8 years. The length of the permitting process is dependent upon the type and location of the project, especially if the project is located in a sensitive area. In practice, very few MHK projects have completed the entire permitting process in the U.S., and the majority have exceeded these timeframes. There is no single agency (“one stop shop” facility or entity) that is responsible for the entire ocean energy permitting process. FERC and BOEM are the two agencies with overarching authority over licensing and leasing activities in the U.S. The lead agency is dependent upon the location of the project and whether it will be connected to the grid. Multiple state agencies are also involved in the permitting process. For all projects located on the OCS (generally 3 nautical miles from shore to the exclusive economic zone boundary) BOEM must issue a least that allows the developer access to the site and FERC must issue a license for the project to move forward. A National Environmental Policy Act (NEPA) analysis is always required prior to any action taken by a federal agency. NEPA was enacted to ensure that federal agencies evaluate potential environmental impacts of any proposed action and reasonable alternatives. As a result of an initial scoping process, the project either receives a Categorical Exclusion (CX), and Environmental Assessment (EA) or an Environmental Impact Statement (EIS). The results of the NEPA analysis and multiple consultations that occur before leases and licenses are issued are often used to generate monitoring or mitigation requirements that must be implemented as a condition of the license. The FERC pilot project guidance places large emphasis on post-deployment environmental monitoring while the standard commercial licensing process places a larger emphasis on environmental studies conducted before the license application is filed. The Energy Independence and Security Act of 2007 directed the Department of Energy to work with the Department of the Interior and Department of Commerce to develop a program to support research and demonstration and commercial application to expand the use of marine renewable energy sources. It also allowed for the establishment of the National Marine Renewable Energy Centers. There is no regulatory authority conveyed by this Act. FERC carries out its regulatory authority under the Federal Power Act. In 2008 FERC developed a Guidance for Pilot Project Licensing to speed up the licensing process for demonstration projects. BOEM has also developed a set of regulations governing its OCS Renewable Energy Program. The Energy Policy Act of 2005 provided guidance for federal regulation of new renewable energy technologies in general and amended the OCS Lands Act to give the Secretary of the Interior the authority to regulate the production, transportation or transmission of renewable energy on the OCS. This authority was delegated to BOEM. Essentially, the Energy Policy Act conferred regulatory authority for hydrokinetics to both FERC and the Department of the Interior (DOI), but the law did not clearly specify the scope of each agency’s jurisdiction. To remedy this, the FERC and the DOI signed a Memorandum of Understanding (MOU) in 2009 clarifying the scope of each agency’s respective responsibilities for regulating renewable energy projects on the OCS. Executive Order 13514 “Federal Leadership in Environmental, Energy and Economic Performance” called for the increased use of renewable energy by federal agencies and aligning federal policies to increase the effectiveness of local planning for locally generated renewable energy. Plans for changing legal and administrative frameworks to facilitate development and more integrated marine governance: The Marine and Hydrokinetic Renewable Energy Act of 2013 proposed to amend the Energy Independence and Security Act of 2007. This act has been introduced to the U.S. Senate but has not received legislative or executive approval. Consultation with various stakeholders and regulators is performed at multiple stages of the process. Stakeholder consultation stars at the very beginning of project development, and public comment periods are incorporated into each of the regulatory stages. In order to receive a FERC license or a BOEM lease, a series of mandatory consultation are performed, usually in conjunction with the NEPA analysis. Various reference materials are available to developers to provide additional details on the licensing process. These include FERC’s “Handbook for Hydroelectric Project Licensing”, “Hydrokinetic Pilot Project Criteria and Draft Application Checklist” provided by FERC, and the “Handbook of Hydrokinetic Regulatory Processes”. The PacWave test site, to be built off the coast of Oregon, will generally be pre-permitted for most types of wave energy converters. However, there may still be additional regulatory processes or consultation needed prior to testing, particularly if the testing is supported by federal funds, which would require a NEPA analysis. Data collected at the site could also be shared to help accelerate the process for permitting in general.